Look for smaller zucchini for best results. fresh squeezed lemon juice (about 1 wedge) - 1 tbsp. 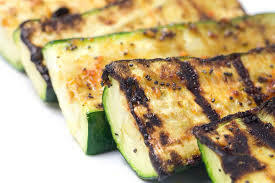 1) Cut zucchini lengthways into 3 slices. 2) Whisk together Roasted Garlic Oil with Garlic Scapes, Garlicky Italian Seasoning, lemon juice and salt & pepper. Pour over zucchini and marinate 30 minutes. 3) Preheat BBQ to high. 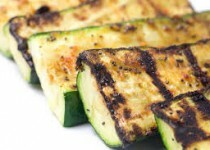 Place zucchini on grill and grill 2-3 minutes per side, brushing often with marinade. Grill until tender. May serve warm or cold.